Personal protective equipment are items worn to minimize exposure to hazards that can cause serious injury or illness. In the world of masonry restoration, our most common forms of PPE include hard hats, protective eye wear, face masks and respirators, work gloves, and steel-toed work boots. 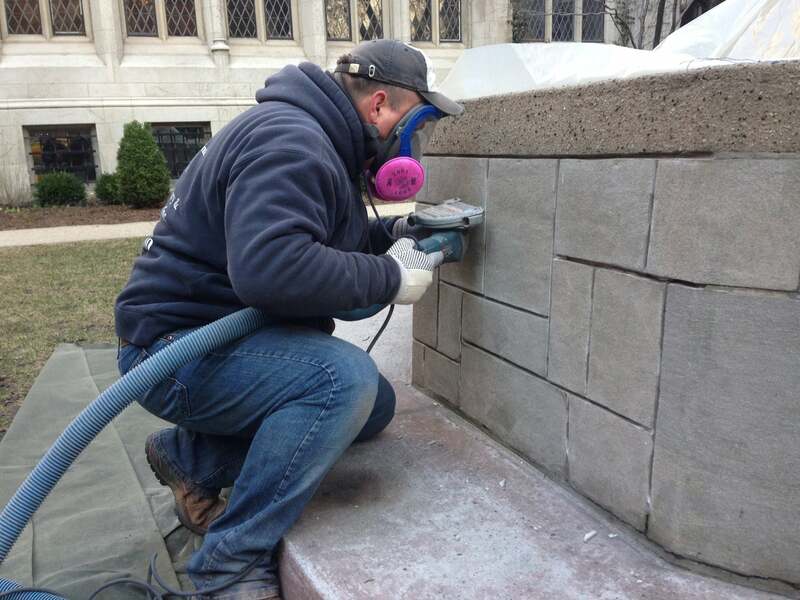 During a recent project on the Magnificent Mile in Chicago, the men ground out and tuckpointed defective mortar joints on a very lovely and historically significant century-old fountain (see image at rightabove). PPE on this project included full face masks with pink P-100 filters to avoid inhalation of mortar dust (a common cause of silicosis), long pants and gloves to avoid cuts and scrapes, and steel-toed shoes. The grinder held by the mason has a safety guard installed over the blade to avoid serious injury, as well as a vacuum attachment to minimize the amount of dust released into the environment. From senior project managers to laborers, every one of the men at AAA-1 Masonry & Tuckpointing, receive on-going PPE training. We all carry OSHA 10 certification, scaffolding certification (suspended, fixed and system), and maintain an impeccable safety record. The men were busy dismantling and rebuilding what had been a relatively new chimney on a beautiful home in downtown Hinsdale. The premature degradation of the chimney was due to the bricks selected by the developer and the amount of Portland cement used by the mason. These bricks do not appear to have been rated for severe weather and the mortar was much too hard (developers and architects often specify Type S mortar for brickwork because they wrongly assume harder mortar is better mortar when, in fact, mortar with high ratios of Portland cement are too rigid for bricks and can lead to premature cracking and spalling). With a newly poured concrete cap in place and copper flashing installed, the rebuilt chimney is a real show-stopper. If you think your chimney is in need of restoration, please give us a call at (773) 622-7300 for a free diagnosis and proposal. AAA-1 Masonry & Tuckpointing is renowned for its exceptional masonry restoration work. We take great pride in what we do, and judging by the letters and comments we receive our clients do too! If you've clicked through our web pages and landed here, then chances are good that you're more than little curious about masonry restoration. So I thought it would be fun to walk you through the process of what we do in a single photo taken from a recent project (see below). On the left side of the photo is a mostly untouched 120-year-old masonry building. Although underutilized for years, many of the bricks in this building remained in a structurally sound condition (bricks close to the ground where the snow and rain have collected for years have not fared as well). All the way on the left side of this photo (Area #1) you can see a portion of the wall as we found it. The bricks on this wall have become dark with age, pollutants and weather. The mortar joints have been tuckpointed over the years with repeated applications of mortar but this method of repair has not improved the condition of the wall in any lasting way. Once the bricks were deemed to be structurally sound, we carefully stripped the outer wythe of the wall. Thanks to the forward-thinking building methods employed by the original builders, we were able to safely remove these bricks without catastrophic failure of the back-up wall … even 120 years later! You can see the portion of the wall with the outer wythe of brick removed in Area #2. Once these bricks were removed, they were carefully inspected to verify their condition. After grading and sorting, the bricks then underwent a gentle but very thorough cleaning process to remove all that grime. The transformation from dirty brick to clean re-claimed beauty was quite incredible! Once dry, these bricks were used to rebuild large sections of the adjacent building (Area #3). With these reclaimed beauties, new windows and new stone windowsills, the restored structure on the right is not only breathtakingly beautiful but also should last another 120 years! We really enjoy breathing new life into old buildings, but that's not all we do. We also grind out and tuckpoint mortar joints, replace lintels and shelf angles, caulk windows and doors, and fix and seal new brick-and-concrete block construction (which is how most of the homes and buildings in the last 20 years have been constructed). Let our licensed masons assist you with your next project and get ready to be pleased! We use flashings to stop water from infiltrating masonry walls. Seasoned AAA-1 Masonry project manager, Brent, recently photographed this flashing "detail" observed on a client's newer masonry wall. 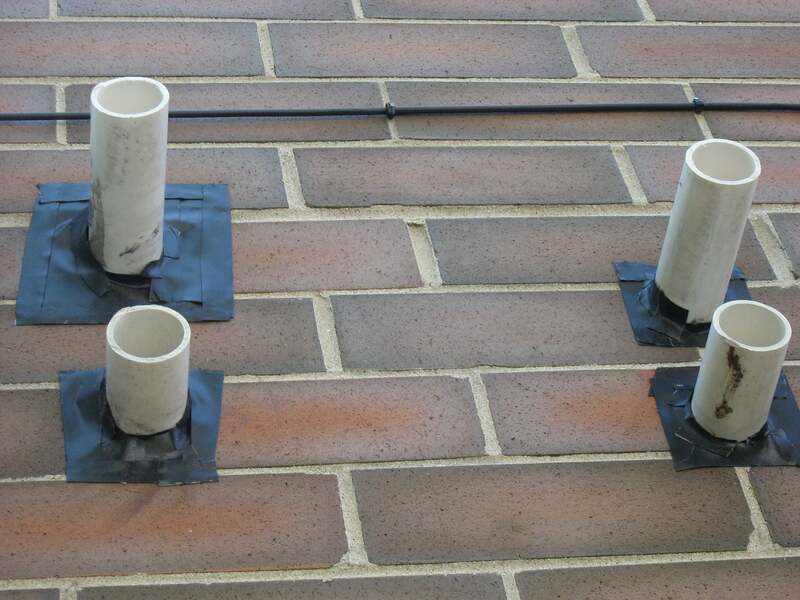 Although the intentions of the original installer may have been sincere, this is a pitiful attempt to prevent water from from penetrating into the wall cavity through the gaps between the round white PVC tubes and the bricks. Frankly, it looks like something my 7-year old might have constructed during a school art class. The proper method of sealing gaps between wall penetrations (e.g., vents, electrical conduit, etc.) requires the use of primer, backer rod or bond-breaker tape, and high-quality caulk (not surface-applied adhesive as in seen in the photo). If this condition were to go uncorrected for any period of time, the flashing would begin to peel off and serious water infiltration would result, likely evident in the form of damaged drywall, electrical shorts, rotted floor joists and/or warped floors. If you would like one of AAA-1 Masonry & Tuckpointing's seasoned project managers to inspect your home for damage (or ridiculous workmanship like what Brent found here), please do not hesitate to call us at (773) 622-7300. We are here to help!